If you are looking for a great toy that your child would instantly fall in love with, then look no further. Electric powered ride-on vehicle toys for kids have become one of the most cherished toys that kids easily fall in love with. Kids are thrilled that they can now be the conductor of their own sized cars. These youngsters can easily drive around in the compound and moreover, make their friends envious, just like how we adults do it. So, the big question is: which brand has the best electric powered ride-on vehicles for kids? In this article, I will be revealing the best ride-on vehicle toys that will give your child a perfect driving experience. So let’s get started by taking a look at what each of these electric powered ride-on vehicles have in store for kids. 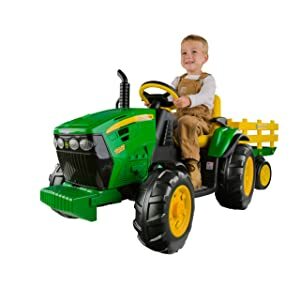 If you want the best farm tractor toy for your child, then the Peg Perego John Deere Ground Force Tractor is an excellent choice for your baby. About three years ago I bought this tractor for my son. Although it’s a toy, it’s a pretty decent piece of equipment that comes with a great set of practical design. The ride-on vehicle is robust and easy to drive. It comes with a battery that takes about 18 hours to charge when you newly purchase it. This toy is ideal for children 2years +, and it takes1 ½ hours to assemble. What Makes this Ride-On Toy So Great? The coolest feature about the John Deer tractor is that it has a working FM radio. The ground force tractor has 12 volts of powerful batteries, two different speeds, and accelerator pedal. It also has four lenses on the front and two lenses at the back. The back lenses have some reflecting tape underneath to make it look shining. Gear 1: 3.5 km/h; the Ground Force Tractor goes two speeds for (Gear 2: 7.3 km/h) and one speed in reverse (3.4 km/h). Peg Perego Toys are very resistant. It also comes with the mode where you can keep it locked at the lowest speed. The wagon is large enough to hold your child’s most important cargo. It has an adjustable seat for your child plus adjustable armrest. Kids get a little frustrated with the back opening up on its own just from the vibration of the car. The wheel certainly does not look as if they’re going to last forever, but you can easily buy a replacement online. The assembly instruction is a little bit technical to follow. 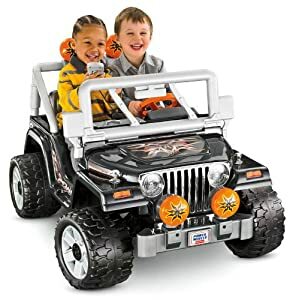 As one of the most trusted names in quality kids toys, Fisher-Price Power Wheels Tough Talking Jeep Wrangler is one of the safest and realistic driving machines. Kids love this talking jeep wrangler. The jeep comes with a talking microphone with strong sound effects and a unique voice amplifying speaker. The jeep is recommended for children 3-6 years of age with the maximum weight capacity of 130 pounds. The power wheel is a perfect replica of a real vehicle and has model dash and steering wheel. Excellent rear storage just like the real life Jeep, and allows your child to carry their favorite toys around with them. This is the feature a lot of parents love about this car. What Makes this Electric Car So Great? This jeep wrangler has rugged sidebars that make it easy for your little one to go in and out. 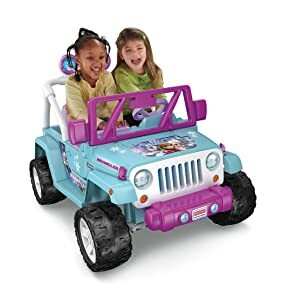 The power wheel tough talking jeep wrangler goes two speeds forward (2.5 and 5.0 MPH) and one speed in reverse (2.5 MPH). This electric car for kids is powered by a rechargeable 12-volt battery and charger included. The body of this Jeep Wrangler is constructed from hard plastic and also loaded with all the extras including side new mirrors, convenient grab bars for easy in and out. The ride-on vehicle has a front seat big enough for two so that your driver doesn’t have to go on adventures alone. It also comes with big rugged tires that allow your kids to take their adventures off road since they can move on hard and grass surfaces. Large enough for two children to ride at the same time comfortably. Power lock brakes for extra stopping safety. Sometimes it comes without a seat belt. 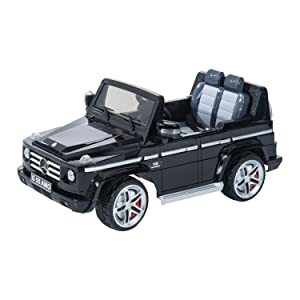 The Mercedes-Benz G55 is a great toy that allows your child to have great fun driving the vehicle with ease. It is a great ride-on toy for toddlers as it allows the parents to drive the vehicle around until the time the child is old enough to drive the car themselves. This electric car for kids has a front seat big enough for two with a Maximum Weight capacity of 66 lbs. What Makes this Ride-On Car For Kids So Great? It includes three modes of driving: neutral, forward and reverse. One of the unique features is it comes with a Bluetooth remote. Another coolest feature of this car is that it has a soft Leather seat. One of the coolest features about this car is that it has real rubber tires which make an excellent grip on a hard surface. This toddler ride-on toy comes with an MP3 sound system and parental remote. It comes with a battery charger, so it is ready to roll at all time. Rubber seat and seat belt for one. Wireless remote control or manual operation. 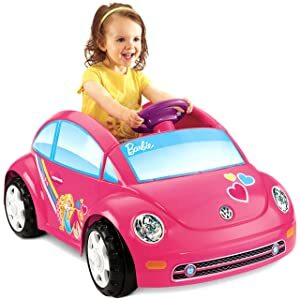 If you have a little girl who is always on the go, then she’s going to love playing with the Fisher-Price Power Wheels Barbie Volkswagen Beetle Toy Car. This Ride-on toy comes equipped with all the extras that will make even Barbie herself jealous. The beetle is recommended for children 18-5 years of age with a mass weight capacity of 50 pounds. What Makes this Ride-On Vehicle for Girls So Great? The body of this ride-on car for girls are durably constructed from hard plastic which will make it last longer. It sounds like a VW beetle and features a bunch of full Barbie inspired dream house to make it a hot ride. The driver side door opens and closes for easy in and out. A rechargeable 6-volt battery powers this little cruiser. It also comes with a battery charger, so they are ready to experience the ultimate driving experience at all time. The beetle goes 2.5 mph forward and reverse. With the push of the seat paddle, it reaches an easy and safe top speed of 2.5 miles per hour on hard surfaces. It comes with a Power Lock Brake System that allows your little girls’ safe travel. It might be too small for ages 4 and up. The battery is not up to 12 power volt capacity, so it runs down quickly. This beautiful ride-on car for kids is perfect for ages 3 and up. Your child will love cruising in the power wheels Disney frozen jeep wrangler. On hard surfaces and grass, the Wrangler can travel at a speed of 2.5 mph. The jeep is recommended for children 3 to 6 years of age with a mass weight capacity of a hundred and thirty pounds. It has real doors that open and close. It also has a front seat big enough for two, so your driver doesn’t have to go on adventures alone. Also, it has a quickly programmed radio that plays different songs to provide a fun soundtrack while they cruise around the yard. This heavy duty toy is powered by a rechargeable 12-volt battery monitor that helps the vehicle reaches a top speed of 5 mph and 2.5 miles in reverse. It has windshield wipers, Cool headlamps, parking lights and fog Lamps. The jeep wrangler comes with a Battery retainer under the hood and Pretend in dash radio. The electric powered car comes with a Bucket style seating for two. The Initial charge time of this motorized car for kids is 18-hour Minimum and 30 Max. For beginners, parents can use the quick lock out features. The power lock brakes make it super easy to come to a stop. It has big rugged tires that allow their adventure off road since they can handle both hard and grass surfaces. Low speed, high-speed reverse shifter. The Power Wheels also comes with a Storage behind seat. It doesn’t have a seat belt for added safety. The Fisher-Price Power Wheels Kawasaki Lil’ Quad is a power wheel for younger kids. It is beautiful, safe and comfortable for them to use. The Lil’ Quad, comes in a couple of different style options. The Fisher-Price Power Wheels can be driven by both boys and girls at age 1-3 years old with a maximum mass weight of 40 pounds. What Makes this Toddler Riding Toys So Great? The ride-on vehicle has a push button operation which makes it easy for kids to stop and go. It works on hard surfaces and grass. The ride-on car comes with 17 feet of easy to assemble track. Power Wheels Kawasaki Lil’ Quad also comes with a rechargeable battery and charger. It takes 25 minutes to assemble and comes with two strips of bumpy tracks. The built in front rest offers a safe and easy way for little kids to climb on and off the vehicle. The track option makes it safe for younger children. It can be hard to put together. The battery is not up to 12 power volt capacity which might make the battery not to last for a longer period. There are so many varieties of ride-on toys which are available today on the market. I’m sure it would be very tempting for you to go to a close shop and buy the first one you see. There are so many things you need to keep in mind while choosing the right ride-on toy for your child. So, today, we have put together some tips on picking the right ride-on vehicle for your child. The very first thing you need to consider when buying a powered ride-on vehicle for your child is to look at the durability of the electric powered toy. Always go for Vehicles that are durably constructed and will stand the test of time! Make sure you find out what other buyers have said about the product. Is the ride-on car made of solid plastic? Is it durable? Will it be able to carry my kid for a long time? These are some few questions you should have in mind when choosing the right ride-on car for your child. If you want to buy the right toy for your child, then do not compromise on the quality of the ride-on car. You get what you pay for! So, don’t forget that better cars by design will last longer and have better resell value when your child eventually outgrows it. Alternatively, a well-built ride-on car can be handed down to younger brothers and sisters eight years down the line. Think of it like this; one good quality powered ride-on vehicle is much cheaper than two or three bad ones. So, it is best you choose high-quality ride-on vehicle that will last your kids longer and give them the best driving experience. When you are picking up a ride-on toy for your child, consider keeping their age in mind. Make sure that the ride on toy is appropriate for their age. If you pick a ride-on toy that is beyond your child’s age, you’d be surprised that she might not be interested in that toy. The more comfortable you child is while driving, the more used the car will get. So, look out for a ride-on toy your child can easily manipulate with less coordination. So I think we parents need to step back sometimes and allow these kids make some decision on the kind of ride-on toys they love to play with. We may see something we think could be so perfect for our child, but there’s nothing worse than to seeing your kid’s face drop when their brand-new powered car is green and not blue. It’s best for everyone to bring their child to the shop, or carry them along while shopping online. Let them decide on what they want before making a buying decision. You should always do a safety check on any ride-on toy that catches your attention. Ensure you choose electric powered vehicles that come with a speed lockout feature. This will ensure the car does not go beyond a considerable speed limit. Also, ensure that the ride-on vehicle is produced to reach a manageable, safe speed limit. Also, find out if the battery of the ride-on car you wish to buy runs down quickly. If the ride-on car comes with a 6-volts powered battery, then you should be expecting a speed of 2.5mph. But if the car comes with a 12 volts powered battery, the car will run at a speed rate of 5mph. If your ride-on car does come to you in a box, make sure you have a decent set of tools which you will use to assemble it. While some manufacturers will provide you some multi-tools, it is always helpful to have some basic set of these tools to help put these cars together. Make sure the ride-on toy you are going to buy for your child comes with a simple and easy to use functionality. We have a lot of toys on the market; although they are great, they are full of extras that can be hard to operate. So, go for toys your kid can have fun with!